We are engaged in research to understand the molecular events that underlie the cardiac growth response, both developmentally and in the adult heart, after pathologic stimuli such as pressure overload (hypertension), ischemic injury, infectious agents, congenital malformations, valvular disease and genetic mutation in sarcomeric proteins. Stress- and growth factor-responsive signaling pathways transduce developmental, physiologic and pathologic stimuli to affect myocardial maturation and remodeling at the whole organ level, the cellular level and the molecular level. These signal transduction events are typically very complicated and involve the orchestration of G-protein-coupled receptors, receptor tyrosine kinases, various traditional G-proteins and the low molecular weight G-proteins of the Rho family, adaptor signaling complexes, cascades of kinases and phosphatases, and – ultimately – transcription factors. We are working to define novel signaling and transcriptional regulatory events that underlie the hypertrophic program at each of these various levels. We rely heavily on generating gene-targeted (knockout) transgenic mouse models to assess the function of specific signaling factors within the intact myocardium. We also use tissue-specific gene targeting in the heart and temporally regulated gene activation and inactivation in vivo. 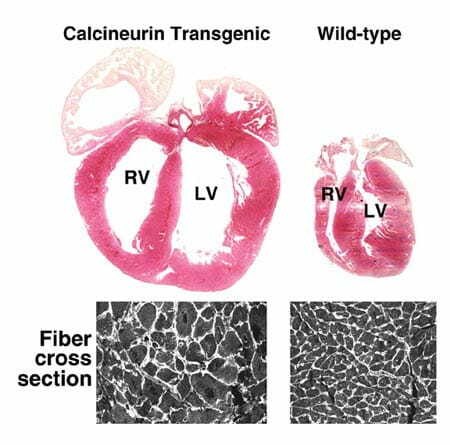 We also utilize adenoviral-mediated gene transfer in cultured neonatal rat cardiomyocytes as an additional model for investigating the cardiac hypertrophic response.